A couple weeks ago I was adding a two small flower beds out in front of the house between the sidewalk and the road. Since it was “closing time” for the seasonal plant centres, I went scouring for bargains. Walking around I found two beautiful sage plants. Some herbs aren’t very decorative but sage actually is very decorative if you let it go to flower. That’s usually not a good thing for most herbs if your intent is for kitchen use, but since these will be out front, subject to dog pee, and such a good price I took them. I paid $4 each for what I consider really good plants in 1 gallon pots. You pay $3.99 at the grocery for small pots. So I thought they were a real deal. I found them at Home Depot, if anyone’s looking. 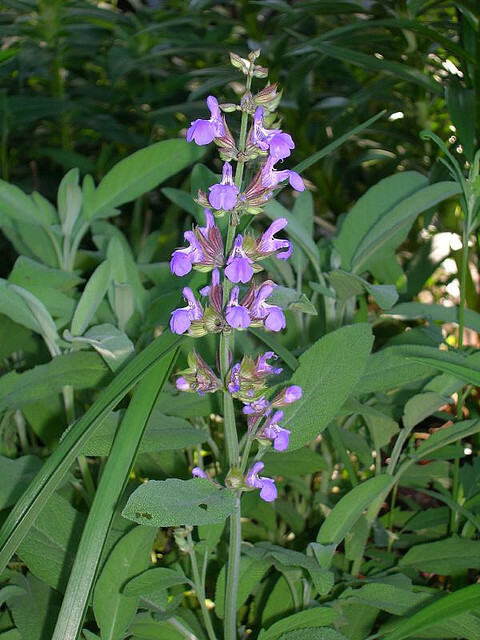 Garden sage (Salvia Officinalis) is a hardy perennial that likes lots of sun, moderate water and fairly dry soil. It’s what is called a “clumping herb” and is grown for both its leaves and flowers. The leaves grow to upwards of 3-4” long and are a beautiful grey-green. There are also golden, purple and variegated varieties available. Clumps of sage can grow quite large, and it’s hardy to USDA Zone 4-8. That’s perfect for our climate. Friends of ours have a sage by their deck steps that seems to come back more ferociously every year. Starting from a single plant it is now easily 3 feet across and gets covered in purple flowers every year. 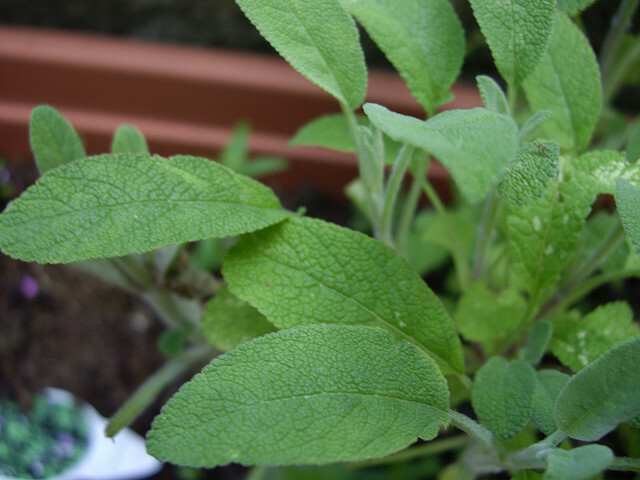 A native of the Mediterranean, the name comes from the Latin Salvare which translates to “save” or to “heal.” Medicinally, sage has been used for respiratory infections, congestion, cough, sore throats, appetite stimulant, indigestion and is also said to have a beneficial effect on the liver. In the kitchen sage is a four season star. It can be used both fresh and dried. It can easily be dried in a low oven until it can be crushed by hand. Another method is to hang bunches dry but there is a risk of mould growing on the leaves if done that way. We have one sage plant in a spot where we can ensure it’s not watered by canines and use it quite often. 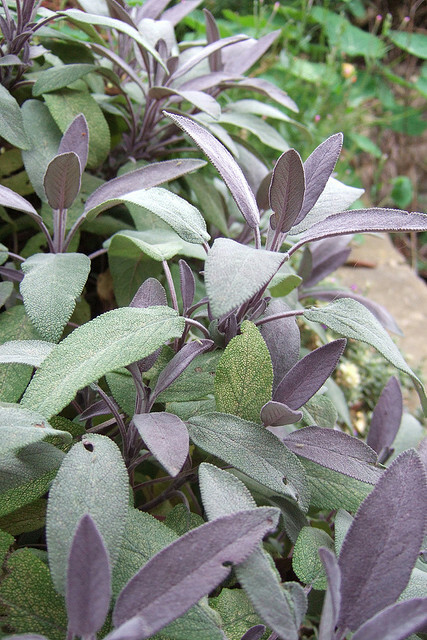 Sage is a common accompaniment for pork and turkey, but has uses far more vast than those. Here’s two recipes for pasta accompaniments: one uses leaves; the other flowers or leaves. An excellent way to use it is possibly the most simple. 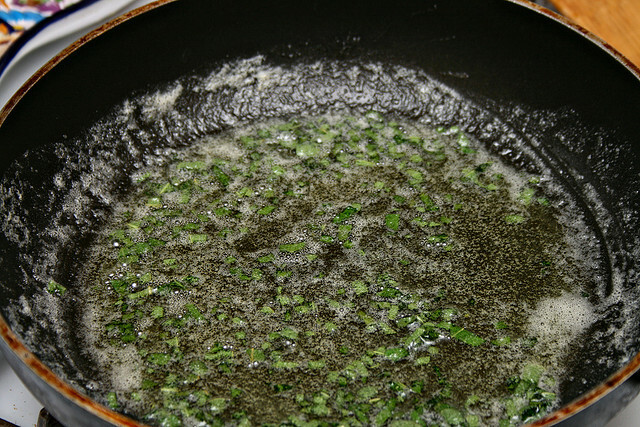 Melt the butter in a skillet and add the sage. Fry the sage until it becomes darkened. Watch out as it can burn and become “off” flavoured. The butter will turn slightly green in the process. Toss the sauce with any kind of pasta, gnocchi or ravioli. the recipe makes enough for 4 people. Yes, this sauce is is absolutely delicious. And no, it isn’t low fat. 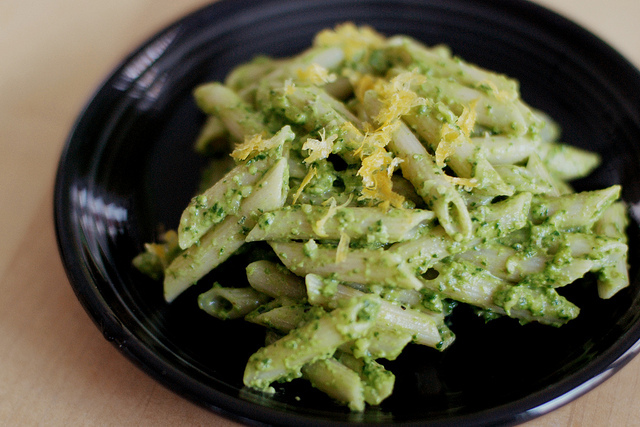 I haven’t made the following pesto recipe this year because I don’t have enough flowers yet, so there’s no picture. Sorry. You can substitute sage leaves for the flowers for a wonderful green pesto if you wished. Place all the ingredients except for the oil and parmesan in a food processor. Pulse until well chopped. With the motor running, pour 1/2 cup of olive oil into the mixture. Let it run until well blended. If it’s too thick add a little more oil. Remove the pesto to a bowl and stir in the parmesan. 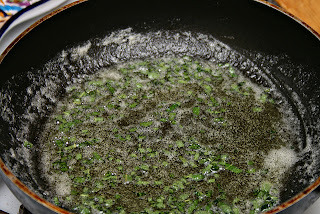 Many recipes add the cheese in with the herbs but I find the texture is nicer if it’s added at the end. You can add it with the flowers and nuts if you prefer. Besides using it on pasta, a few tablespoons would also be excellent stirred into a mushroom risotto just before serving. 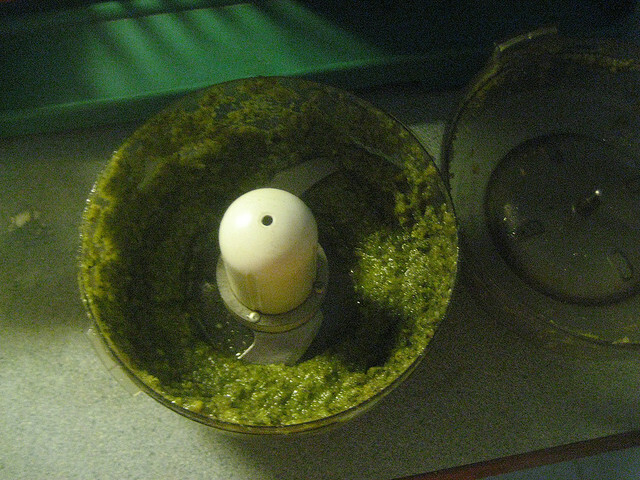 The recipe makes between 1-1/2 to 2 cups of pesto.